Illuminated Manuscript, Gloss on The lamentations of Jeremiah, Walters Manuscript W.30, fol. 3v, originally uploaded by Walters Art Museum Illuminated Manuscripts. 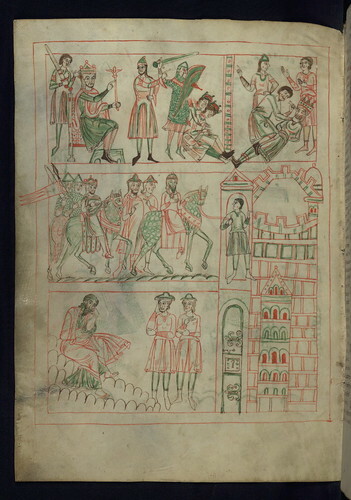 This illustrated copy of The lamentations of Jeremiah with the gloss (or interpretation) of Gilbert of Auxerre was written in Austria in the second half of the twelfth century and comes from the monastery of Seitenstetten. Gilbert died in 1134, and the manuscript is an early and important witness to his text. The gloss is written in a small script and is both interlinear and marginal. This layout is typical of glossed books of the Bible from the twelfth century. The illustrations of the sack of Jerusalem and the return to Babylon give valuable information on twelfth-century armor. The manuscript is in its original binding. Execution of King Sedekiah of Judah's sons; Blinding of Sedekiah; Return to Babylon with the blinded king; Jeremiah lamenting before a walled city.